Not a bad idea. I changed it and it looked a lot better. Good idea with the monsters, too, though they are likely just placeholders. I'm considering trying my hand at animating them, but that won't be until the whole system is more stable. I also have been doing more tinkering. Finished coding a second skill selection menu. This one was suppose to be easy but somehow ended up providing me hours of endless frustration. Nonetheless. Behold! It's simple, weapons, shields, and some accessories give you special skills you can use only when they are equipped. These skill require adrenaline to use, which you gain in battle for various actions. Being attacked raises your adrenaline, attacking raises it, using magic raises it, and it raises at different rates for different characters. I'm really happy about this one. I know it doesn't look like much, I've been mostly working on code that goes on in the background, but recently I started animating the battle system. I'm working on all the basic stances for the playable characters and it's coming along quickly. Today, I finished Jake and Timber. Jake's model is clearly based off of the old sprite I used by InsaneJP, but Timber's model is completely redone from the old one I was using. 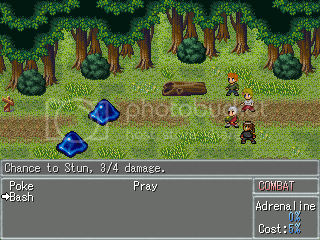 Also, you may notice Martha, the second character in the party, is afflicted with a status effect. That's mainly what I've been working on, getting status effects to function properly. They are mostly done. Things like poison, confusion, berserk, stun, paralyze, weak, etc., have all been coded, including skills that can inflict them and protocols on how to apply them and what has priority over what. Lastly, the sprites are obviously different. They're the slime sprite from RMXP. It's a long story, but I was sort of forced to switch to using charasets as enemy sprites due to the way battle animations interact with pictures. I had to use a patch to swap the layers on which battle animations and pictures appear on, since battle animations were occuring over the HUDs. Unfortunately, that caused battle animations to occur behind monster sprites. That was obviously undesirable. So, I found ANOTHER patch that allowed me to use whatever size charasets I wanted, solving the priority issue while also now allowing me to animate monster sprites more easily, should I choose. I haven't decided on that, since it also means a lot more work. I'm considering the possibilities. Whew, kind of a mouthful. It's been exciting and a lot of work, but very rewarding. I hope to maybe release a tech video or demo some time soon, I won't say when. It could even be another month or so. Multiple statuses, fully animated and characters I know and love? Awesome!! How'd you know I was thinking of Apathy allot over these last few days? Really want to play that game again. I do have to say though Timber was cooler as a Dire Wolf-like character XD Now he looks so small and scruffy it's hard to be intimidated by him! ^_^ Though I do like the edits you added to my Sensei's version of Cloak The pockets, the lighter gloves and even the hair is almost the same but somehow better! =O It's neat how you've modified RM XP, yesterday's news to most, to do this! I may have to see about getting a XP with size augmentation mod like you did. o.O Since it seems I'm doomed to never be able to use RPG Maker VX or VX ACE. - -; Still keep up the good work! Fish, he only modified the XP sprite, I'm pretty sure its still in rm2k3 based on Dren's dynrpg adovcating. Thanks, Fish! but AFL is right, this is an event based CBS in rm2k3 using dyn plugins. As for Timber, I get that. I've just fallen hopelessly in love with this newer, cuter version of her. Also, realistically, she's a more appropriate size compared to the other sprites. Both Jake and Timber are suppose to look scrappier. Whoa! So that is 2003!? Just with this dynrpg thing....Interesting. o.O Defiantly have to give you more props for that then. Also shocker! I didn't know Timber was a chick! o.O Only seen her in sprite form. never managed to get up to that part. >-< Stupid AoA glitched out I think. That was back before I knew how to patch them too...Then again I still have the original copy I think. <.< Yeah it's on my back up drive with Carpe Diem which I used to confuse it for till I got to know Linkforce better. XD Anywho back on topic: She does look better smaller and scruffier. XD Dogs should match their owners after all and vice versa. What game is that? Why can I not find a page? I wanna play! Never played as a wolf in an RPG before! I believe the old page was relegated to the archives... I couldn't find the old game thread. I don't know if I deleted it or if it was lost during one of the forum updates. I found the old RMVXACE reboot thread from a couple years back, which was a failure but a fun experiment. I don't believe there are any existing downloads to the old demo and even if there were, I remember there was one crippling, unavoidable bug right at the end of it. It should also be noted, I'm not working on the game, that project has long since been disbanded. 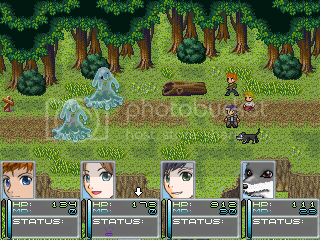 I'm just using the sprites and old project files to work on a custom battle system I've always wanted to do. Still got your "AoA beta" from 2011 though if you want it. Thanks, Purp, but I have a backup of the last demo I released on my hard drive.